We need to talk about this. If you’re anything like me and felt like your heart was stomped all over at the end of the new Who series 4, this won’t make up for it. But it will sure help a whole bunch. In my mind, the worst fate a Doctor Who companion can have, is the mind wipe. Ironically, my three favorite companions were all written out of the show, by the Doctor being written out of their memories (the other two were Jamie and Zoe in case you weren’t sure). And they remain the only companions to leave the show in that way. This makes retconning further stories for them a bit tricky. Look at their happy little faces. They don’t remember any of it now! How COULD you?! 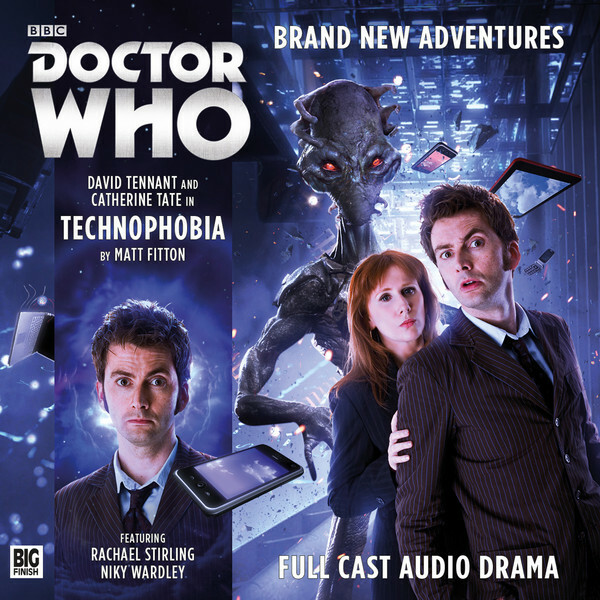 This was not my first foray into Big Finish audio, but I’m not a seasoned listener by any stretch of the imagination. 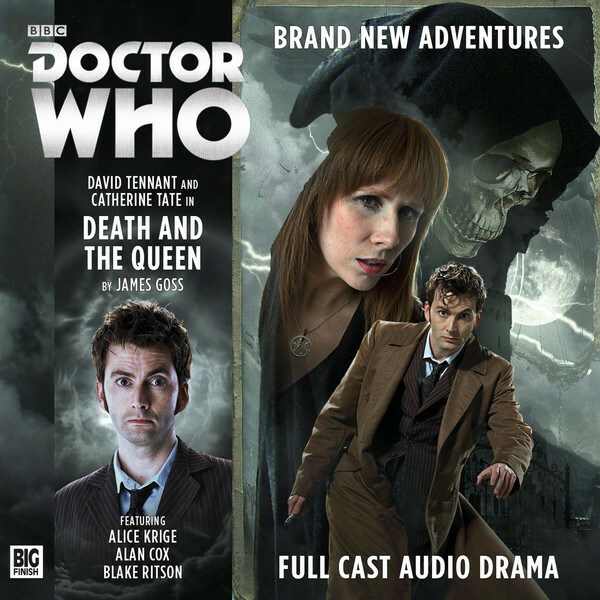 When I first heard that Big Finish was going to be doing 10th Doctor audio adventures I was thrilled. I thought they might slot it into that weird series of specials between series’ 4 and 5. But then they want on to say Donna would be the companion. Ensuing my little mini parade at this news, I collected myself enough to realize that these must take place DURING series 4. So I went through a list of episodes trying to place them. I had thought, “well, that would be easier on them, the story arch while Rose and even Martha were the companions is so tightly knit together.” I had thought that’s not so much the case in series 4, at least not until the end. And I was super wrong. I took another look at the episodes in series 4 and there are very few episodes that can actually shuffle position. So when these stories take place is up for debate, and indeed if the episodes they’ve released are in order. They certainly don’t appear to happen back to back, but we do occasionally get clues. And when you get down to it, does it really matter? Classic Doctor Who opener (I mean classic new Who opener…er…I mean…oh, you know what I mean). Strange behavior from technology, the Doctor and Donna introducing themselves to characters we know will be important later on in the story, then *BAM* inciting incident. The Doctor shouted “Donna! We’re on,” the theme kicked in, and I got the chills. It was just like the good old days. The episode (yeah, I’m calling them episodes. I’m not sure that’s the proper term, it’s just easier for me) is set in the not too distant future in London, and at first glance it appears that the machines have gone all Hal 9000 on us, but it turns out to be more dastardly than that, and there are aliens, and it’s a whole big try-to-take-over-the-world thing, but they go about it in a way that’s really fun for a Doctor Who fan to listen to. As the story wears on, more and more of the characters start to develop a fear and forgetfulness (mainly of technology, but it kind of branches off into other areas) via mind tampering. It’s a premise that is properly frightening, but also used to a tremendously funny effect. Especially when we discover that the Doctor isn’t immune to it, as he assumed he would be, and suddenly has trouble with things he knows as well as the sonic screwdriver. This is also enjoyable as it gives Donna the upper hand for a bit, since he get the symptoms before she does. Bonus points for allowing Donna to operate heavy machinery. The other characters, along with Donna and the Doctor, all end up like the blind leading the blind and it’s ridiculously fun. The original cast of characters are lovely and there’s basically a Donna Jr. in the mix. It’s awesome. Of course, in the the end 10 and Donna get to save the day. This episode is played slightly more for chills than the previous episode. It employs the child in peril as well as the there’s-more-going-on-here, you-don’t-even-know staples that so many strong Doctor Who stories have. They’re on a different planet for this episode, a busy and dangerous one. Mos Eisley style. It also made me think of that scene in Men in Black where they’re in that area that’s like an airline terminal and all the aliens have to check in and go through security and all that. The monster is the most monster-y of the 3 episodes. Basically, it comes across like a bogeyman who wants to gobble up children. That’s not exactly what’s going on, but it sort of feels that way. Then again, by the time you reach the end, you have to re-establish who the “good guys” and the “bad guys” have actually been. Conceptually, it brought to mind a couple different Doctor Who plot lines. In the episode Gridlock, they introduced the idea of emotions being peddled as drugs. While that doesn’t happen in this episode, I was reminded of it by the idea of experiencing time as a sort of drug. On the flip side, it could also be used as a form of horrific punishment. It also made me think of a discarded story that I heard Peter Ling (writer of classic serial The Mind Robber) pitched for Pertwee’s Doctor, in which time would run backward. While, this was again not the case, a story where a Doctor and his companion are not experiencing time properly, and time is used not simply as a device for a setting, created some interesting elements and raised a few contemplative questions. The ending isn’t all sunshine and puppies, the Doctor is profoundly rattled by guilt over the Time War (remember how that was still a thing before the 50th Anniversary? ), and the fate of the little girl is uncertain (but maybe it serves her right?). And Donna admits at a rather tense point, how unfathomably painful it would be if she lost the Doctor (Help! I’m experiencing feelings!). All in all, another wonderful episode. Spoiler alert: Donna’s the queen! But it isn’t that much of a giveaway. We find it out right at the beginning of the episode in a wonderful stinger sequence, that’s really fun, even if you see it coming. Nailing down the setting of this episode is tricky. The Doctor doesn’t recognize the kingdom as being from Earth or any other planet (a major tip-off that something’s very wrong, though Donna doesn’t want to admit it), but for the most part it feels like a historical episode set in medieval times. With monsters. You know, like a Doctor Who episode. Death, as a character, is portrayed as a stereotypical grim reaper type…at first. I was actually laughing at some of his dialogue by the end, and found his character to be a rather fun baddie. As was the case with the previous episode, there are a few tiers of antagonists. Death was one of the more likeable ones. We get a flip from the previous episode in this one. Where as Time Reaver put Donna in a situation where she found herself confessing her true feelings for the Doctor, here the Doctor does the same for Donna. It’s love they both, really. It’s just not a romantic love. The possibility (and inevitability) of their separation is shattering to them each, when they’re forced to face the possibility of a future without each other. I was concerned near the end that Donna was going to lose her agency and it would turn out that this was all a twisted plot revolving around capturing the Doctor and him clever-ing his way out of it, but they were even one further twist ahead of me, and I appreciate the hell out of that. Though poor Donna has the worst luck with being engaged to men who are working with evil creatures trying to take over the world. This one really hit all the right notes, and while they all deserve a re-listen I suspect this is the one I will come back to the most. The version of this that I got has a whole disk of interviews with the cast and crew of all three episodes (as well as an entire disc devoted to promos for Big Finish’s other series’. What are they trying to do to me? I’m not made of money!). It was wonderful hearing the enthusiasm and excitement that everyone clearly had for the project. This was not a fluke. The reason the episodes were so good was because a lot of people poured their hearts and souls into their work to create something special. For the fans, for the characters, for the legacy of the show itself. The caliber of talent from everyone involved is mind-boggling. And the care and attention to detail is wonderful to see. Quite a few of the cast and crew had worked with/on Doctor Who projects in the past, but even the new additions seemed to have a sort of reverence for the material. Apparently Tennant was particularly keen to pair his Doctor up with Donna for these episodes, and the writers and producers were only too happy to oblige. Then, when they got into the studio, Tennant and Tate asked if they could add little things like the (“we’re not a couple”) running gag, which shows up multiple times across the recordings, and shows how anxious they were to fall back into their roles. There’s also a booklet with little page long memoirs from the writers and photos of each of the 3 casts. It’s a nice bit of stuff to add to your Doctor Who shelf (ha! I know, shelves). But even if you’re only thinking of downloading the episodes: 5 stars, would recommend (I just did, didn’t I? ), check it out, have fun, enjoy. Because the 10th Doctor and Donna are back. This entry was posted in Fandom, tv and tagged audio, big finish, Catherine Tate, david tennant, doctor who, donna, the doctor. Bookmark the permalink.